We were all hoping for an improvement in 2019 not a step backwards! I believe I have until the 14th, which is why I didn't try to get it done before today. I think you are right about the mess with calls over the next several days; I just don't want to wait until the last couple of days. The MR Terms and Conditions website (https://www.marriott.com/loyalty/terms/default.mi#elite) explicitly states that Jan 14 date. I waited until the 29th (was considering a short stay over the weekend, chose not to) to claim the 5 elite nights from the Elite Choice 50... which took about 12 hours before it showed up and put me over 75 for the year. Could not get to the Elite Choice 75 site. I'm fine with being a little patient at this point given the 14th as a deadline and no free stay uses coming up soon, but it would be nice if the IT worked/works automatically. I guess it will be a mess for the next few days. I counted I'd be at 76 nights, but a few of my December trips haven't posted yet. It's been 10+ days so I already submitted missing nights, but I held off on the 50 nights in case somehow I wouldn't cross 75, and as a result I can't even choose my 50 night benefit now. I will give them to the end of this week to resolve it before I fire off a support email. You waited in vain. The important date is the year you EARN the suite nights- NOT the year you choose your benefit. Do Suite Night Awards expire? Yes, Suite Night Awards expire on December 31st of the year following the year in which you earned them. 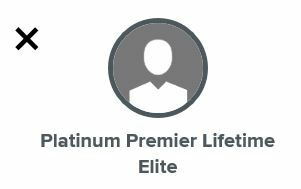 For example, if you achieve Platinum Elite status with 50 nights on October 1, 2018, and select the Suite Night Awards as your Elite Choice Benefit, you’ll be able to use them through December 31, 2019. 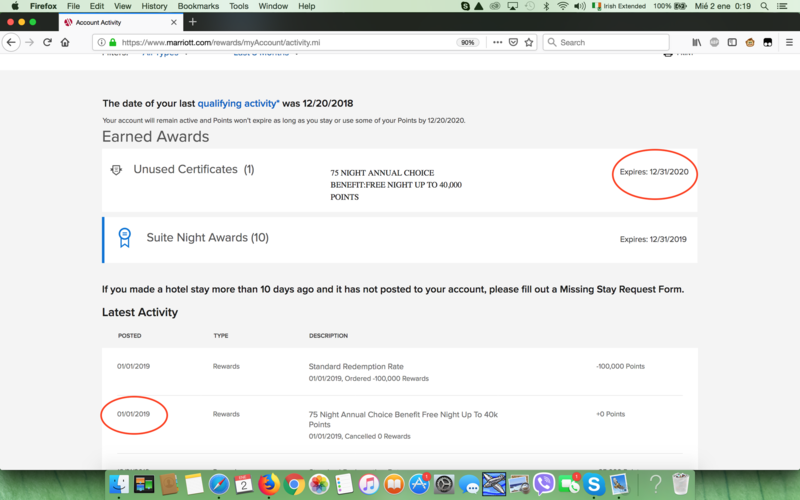 Per Marriott FAQs:Do Suite Night Awards expire? margarita girl and txpenny like this. This is is probably what confused people. On another note, I am jealous that you can actually view your activity. I think I can remember back to a time when I could too. Sigh. SeeTheLights and Old Hickory like this. I'm in a similar situation. 75 nights posted last summer. Selected the 50N gift last year, but cannot select the 75N free night now. Calls to agents were not helpful - after waiting 40 minutes for a "higher-up" department they said system issues and asked me to try again in a few days. I am a Plat 75. Previously chose 2018 Plat 50 benefit. Logged into today to pick my Plat75 choice, but it misdirects me to Plat50 selection page. Cannot choose my Plat75 benefit either. Exact same here - phone call resulted in no help- "the web site is the only way to select the benefit" and "the web site is broken, try back later." This choice was available a while back when I chose the 50 night award...at the time it wasn't clear if SNA expiry was one year from selection, or end of next calendar year so I waited...bad decision. Hopefully on 1/14 it will give me the 5 SNA automatically as promised. Does anyone know if this offered as a benefit of simply achieving platinum elite status, which can be done with $75,000 spend on SPG luxury card - or whether it is truly based on 50 stays? They are pretty careful to mention "50/75 nights" in the T&Cs so I wouldn't hold my breath. Same for LTPP - I don't expect to get these when I stop traveling often. I selected 5 SNAs on Dec 29th and the email said it would be transferred to my account within 48 hours. I have yet to receive them. Anyone else having this issue? You need the nights. My Platinum from the JPM Ritz card did not grant access to the choice benefit. I am LTP (sore subject that) and I hit the 50 nights (actually something like 59 across combined accounts) on my last stays in 2018 (last night was 28/12). My nights stay total seemed to be reflected yesterday when I checked my account, now following the resent there is nothing there and I am told I cannot select the choice benefit. Anyone else had this problem? How do I get it fixed? Try scrolling back 2 pages.